I’ve mentioned before how I have a can have a hard time finding specialty ingredients here on the Eastern Shore. Like – exotic mushrooms for instance. Whenever I take a trip to Annapolis or Virginia Beach, I always make sure to get some funky fungus that I can’t find here at home – chantarelles, oyster, trumpet. I love them all! Thankfully a local friend has started growing her own varieties of mushrooms. I visited her last week to pick up some gorgeous oyster mushrooms (her latest harvest), and was also kind enough to show me her garden, with all kinds of delicious goodies growing. She loaded me down with peas, lettuce, onions, herbs, and broccoli greens! We enjoyed them all week long in various dishes. There’s nothing like fresh picked produce – and growing on Chincoteague Island, right on the water – you can taste the salt from the air and the soil in the veggies. Absolutely wonderful. Thank you so much for showing us your little piece of paradise, Donna! We enjoyed some of the mushrooms and onions sauteed, served over some thinly sliced roast beef and chevre on a baguette. But, the favorite thing that I made last week by far were these delicious spring rolls. I’ve always loved spring rolls from Chinese restaurants – but often the filling is bland and boring. My filling used the gorgeous oyster mushrooms, fresh bean sprouts, garlic scapes, shredded cabbage and carrots, as well as softened rice noodles. They turned out so delicious – rivaling my famous chicken egg rolls. Already can’t wait to make them again! Soak rice noodles in warm water for 25 minutes. Drain well, roughly chop, and set aside. Line a large pot with a couple layers of paper towels, set aside. Heat 2 tbsp vegetable oil in wok over medium-high heat, add mushrooms, cabbage and carrots. Use tongs to “toss” the vegetables. Cook, over high heat, for about 2 minutes. Or, until cabbage begins to wilt. Add the bean sprouts, garlic, soy sauce, oyster sauce, green onions, and vermicelli. Toss to combine and cook for another 2 minutes. Remove from heat. Place a colander in your sink, or over a large bowl. Add vegetable mixture to the colander. Using several layers of paper towels, press down firmly on the filling, pressing out as much moisture as possible. Repeat process several times. Let filling cool for 30 minutes before rolling into wrappers. Heat 3 inches of vegetable oil in a dutch oven. I like to fry the rolls at about 375. While the oil is coming up to temperature, wrap the rolls according to the package directions. Place into oil 4 or 5 at a time, turning over occasionally, until golden brown. Usually about 4 minutes. Remove from oil with tongs, and place vertically into the prepared paper-towel lined pot to drain. This vertical drain is key, as it really helps the rolls not to become soggy. Serve with plenty of soy sauce and Chinese hot mustard. I simply adore spring rolls, but have never made them at home before! We always order them if we see them on the menu. I’ve had oyster mushrooms before – love them! My mouth is seriously watering right now from these pics. 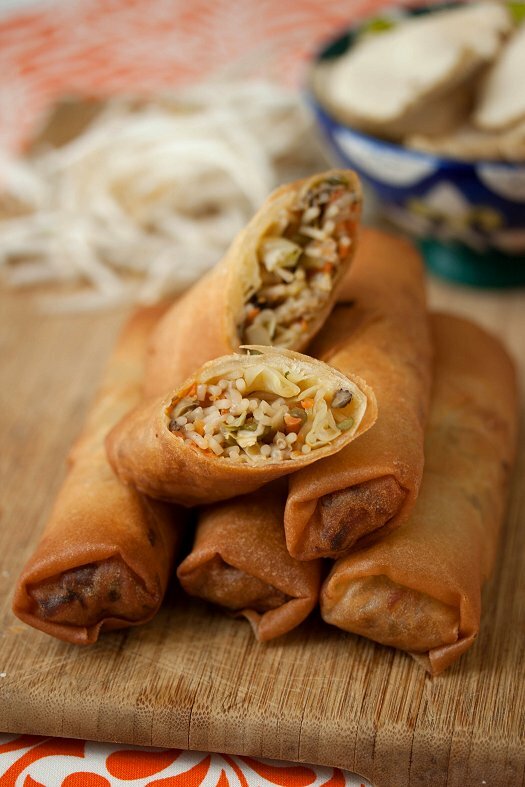 Who doesn’t love spring rolls? Where did you incorporate the cornstarch? Rima, you combine the cornstarch with the water and use it to seal the rolls.